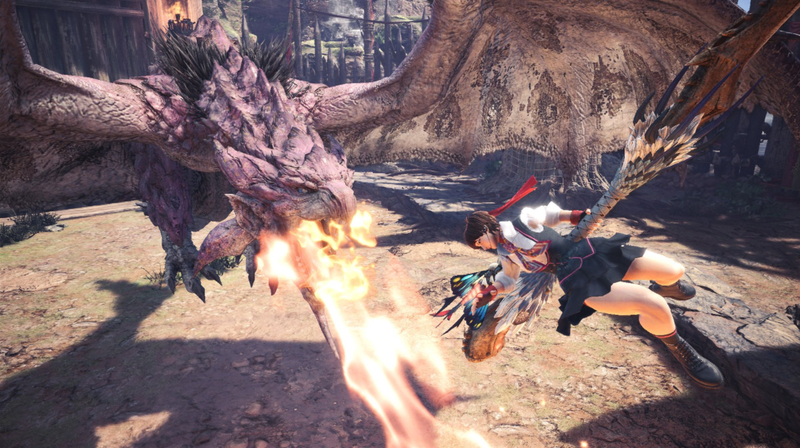 Monster Hunter: World is drowning in crossover events, from the recent Devil May Cry event to a Street Fighter V promotion that allowed players to dress up as Ryu. The Street Fighter love continues with a new event quest that unlocks a Sakura costume. It’s a fun but difficult mission, though the reward is a bit lackluster. If you want to cosplay as Street Fighter’s happiest gal, you’ll need to head to the Gathering Hall and go to the Arena counter. On the last page is an HR 12 quest called “Empress in Full Bloom.” There are three different versions of the quest, but all will grant the same rewards. These are arena challenges, which means each quest offers a pool of set weapons to choose from and limited consumable items such as potions or antidotes. The goal is to fight a high level pink rathian using limited gear, all while dressed as Sakura. Battling the pink rathian is exciting, and the limited inventory means you’ll have to perform at your absolute best. It’s a huge improvement over the previous Street Fighter quest, which forced the player to fight an oversize barroth. That fight was clumsy since the barroth’s hard armor and massive scale meant it was hard to do damage and easy to get knocked around. The pink rathian has a lot of tools to make your life miserable, like itspoisonous tail and fire breath, but you never feel like you’re losing because of a gimmick. It’s a straight-up monster fight. Pick your weapons and dig in. Unfortunately, the process isn’t the smoothest. Sakura’s costume is cool, but it requires a small handful items to create: pink rathian scales, rathian coins, hunter king coins, and Street Fighter V tickets. You can get these items from the challenge quest and even increase your loot drops by completing the mission quickly, but with so many things to juggle you might find yourself missing one coin and doing extra runs until you get one. The armor itself has a few benefits—it has the pink rathian set bonus that increases the duration of your poison and some defense and attack boosts. It’s also a full armor set, which means that you can’t mix and match with other outfits. You either embrace the Sakura way of life or you don’t. This is in stark contrast to the recent Devil May Cry armor, which had really good bonuses and could be mixed with other armor sets. Monster Hunter: World’s quests go back and forth between offering full sets and individual armor pieces. It’s been a problem for a while, and the Sakura event highlights this inconsistency. Seriously, make up your mind, Monster Hunter. If you’re looking for a solid fight that might force you to swap out tactics, this is a great quest. If you want to run around as one of Street Fighter’s coolest characters, go for it. But if you’re looking for a new armor set that you’re going to wear a lot, this isn’t the quest for you. Snag Dante’s armor while you still can or simply wait for Kulve Taroth to come back.